Here Today – Moving Images of Climate Change is a Leverhulme Trust funded artist in residence project (2009-2011) through which Media Studies scholar Julie Doyle and artist David Harradine explored how a creative dialogue between art and media studies could lead to new visualisations of climate change. Most existing media images of climate change deal with and document its visible impacts to landscapes in ways that can lead people to feel disempowered and disengaged. In this context, this project aimed to find new images for communicating climate change; images which seek to provoke different kinds of engagements and action from those generated by current media imagery. A cross-disciplinary project, the residency thus explored some of the different ways of seeing and ways of making meaning that occur in media and the arts, and examined how art and media representations differently deal with levels of abstraction, how they are affected by context, and how they address the relationships between the visual, the poetic and the political. Through these themes, the residency developed a conceptual and creative framework within which a number of new image-based artworks have been created. Embodiment/human - Climate change can often feel distant and disconnected, particularly to western people. The project was concerned with making the human a central part of climate change, and of unsettling the distinctions between nature and culture. How climate change can be made to feel embodied and a part of the routines and practices of everyday life was a key aspect of the framework. Time - Climate change develops incrementally over time and it is not always visible. The effects of greenhouse gases emitted in the past have a visible impact in the present/future, whilst greenhouse gases emitted in the present will not have a visible impact until the future. Climate change is thus a temporally complex issue to understand and communicate. The framework asks us to complicate fixed notions of time in order to help make the temporal connections between climate change and the routines and timelines of daily life. Place/space – Climate change can often feel distant and remote from everyday life. The framework places emphasis upon linking the causes and effects of climate change to the daily spaces and places of people’s lives, and explores how these connect to the more distant locales affected by climate change. The framework was produced through a series of private conversations and public dialogues (including the Here Today blog and research seminars). A manifesto also illustrates the conceptual and creative framework produced through these conversations as part of the collaboration. A printed visual essay, ‘Here Today: Thoughts on Communicating Climate Change’, by Julie Doyle accompanies the film, It’s the Skin You’re Living In. As a way of contextualizing the residency and its outputs, Julie Doyle explains the difficulties that climate change poses for effective communication and understanding. Focusing upon the concepts of nature, vision and time, Doyle explores the challenges and possibilities for more engaging and effective climate change communication and action. A pdf of the essay is available to view Download 'Here Today: Thoughts on Communicating Climate Change'. To create new image-based artworks that make climate change more embodied and linked to the spaces of everyday life, rather than future and distant oriented. How have particular forms of knowledge and representational practices been used by the arts and media to shape our understanding of climate change. How can art and media better communicate climate change as an urgent political and cultural concern. How can climate change be made to feel embodied and a part of the routines, practices, and spaces of everyday life. Drawing upon Doyle’s existing research into the visual and cultural communication of climate change (Mediating Climate Change, 2011), and through conversations with Harradine about the role of the visual, the poetic and the political within arts engagements with climate change, the artist and academic developed a manifesto as a way of capturing early ideas about what the artwork should be about. The manifesto drew specifically upon the themes of the residency – embodiment, time, and place/space/landscape. Doyle and Harradine found the manifesto format a playful and useful tool to capture ideas without being bound to a specific idea or vision. In the end, the manifesto was a perfect way of distilling what they wanted the artwork to achieve as well as identifying some of the challenges of visualizing climate change in ways that make it more meaningful to people’s everyday lives. From the beginning of the collaboration, Doyle did not want the image of the polar bear to be used in the artwork, as academic research has shown that this image, whilst emotionally resonant, is disempowering for audiences, presenting climate change as a distant threat to animals not humans. Yet, through the collaborative process, Doyle and Harradine kept coming back to this image. They decided to try to rework this climate icon instead of ignoring it. The idea was to see if they could use the polar bear to actually break down problematic distinctions between nature/culture and human/animal. The idea was to reconnect the polar bear to humans and everyday practices. The multi-format film, It's the Skin You're Living In, was the culmination of Doyle and Harradine’s collaboration – which involved both public and private discussions, sharing work, sharing academic and art literature, and discussions with others through two public seminars. The film is shot in a series of locations from the islands of Svalbard in the High Arctic to a kitchen in a house in London – via the beaches and headlands of Barra and Vatersay in the Outer Hebrides, the M11 motorway, a dairy farm in Bedfordshire and the outskirts of Hackney and the Olympic Park. The film suggests that climate change isn’t a matter just concerning distant landscapes and threatened animals, but is an ever present part of everyone’s daily lives. 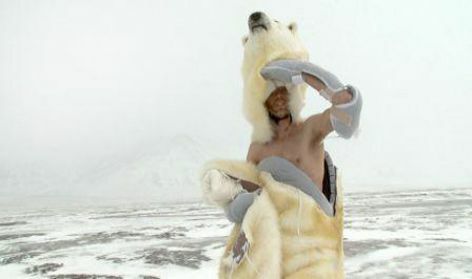 The film follows a man dressed like a bear; a polar bear. Sometimes he looks like a person dressed like a bear – human, fake – and sometimes he looks like he might actually be a bear – animal, real. Over the course of a fragmented journey from the northern reaches of Europe, through Scotland, to the south of the UK, the bear-skin-costume is dismantled, revealing the man inside the animal. Created by Harradine’s performance company, Fevered Sleep, It's the Skin You're Living In is also a mobile app for groups of people to run together. Partly an artwork and partly a film - a film installation for social settings - the app plays synchronised layers of a short film about connectedness, climate, migration and home. In the app version of the film, the content is split across the screens of multiple iPhones. The more phones are linked through the app, the more layers of the film will be revealed. By synchronising the phones and playing the film across them, the app turns an everyday object into a mobile gallery. The Science Museum London, Royal Botanic Gardens Edinburgh, Barbican Centre London, The Floating Cinema as part of the opening of the Queen Elizabeth Olympic Park, Sheffield Documentary Film Festival, NIda Art Colony Lithuania, Battersea Arts Centre London, Greenpeace Germany, ONCA Gallery Brighton, University of Colorado Boulder. Please contact Julie Doyle or David Harradine if you would like to discuss any aspects of the residency with us.